The Design House C-Series 2-Way Latch Privacy Door Handle is finished in satin chrome and designed for left or right hand doors. This handle fits the two most common backsets in the U.S. (backset is the distance from the edge of the door to the center of the bore hole), which are 2-3/4-inch and 2-3/8-inch. The 1/2-inch bolt throw is made of stainless steel and does not budge once in place. 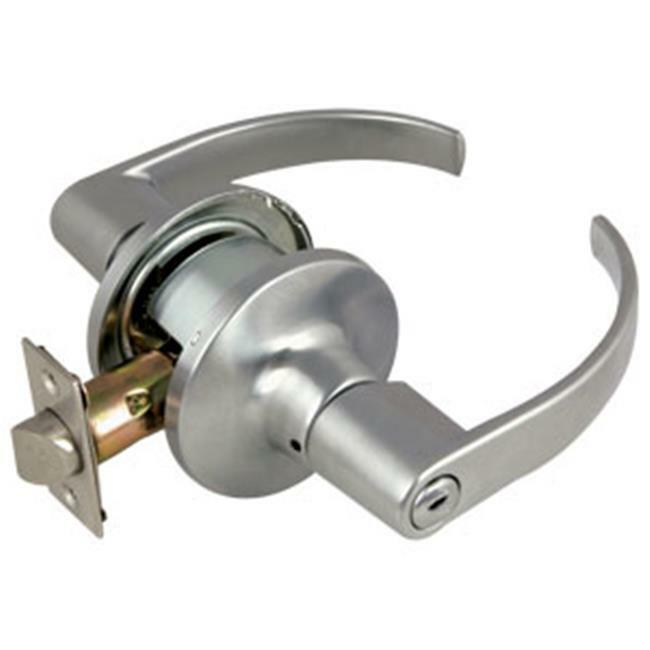 With privacy in mind, this product locks from the inside with a push-button and does not include keyed cylinders. Privacy knobs are often used on bedrooms and bathrooms and are opened with generic tools. Use this knob on standard 1-3/8-inch and 1-3/4-inch thick doors. This product has a 1-inch by 2-1/4-inch square corner face plate. If you are preparing your door for installation, the cross bore should be 2-1/8-inches in diameter and the edge bore should be 1-inch in diameter. This product meets ANSI Grade-2 Specifications, which means this knob is rated for commercial security. Privacy Lock; locks from the inside with a turn-button and feature clearance hole on outside knob/lever to permit emergency release with a nail or like object.